As season's first snowfall arrived at Himachal Pradesh, Jammu and Kashmir and Uttarakhand, the temperatures in some areas in the northern region dipped to minus four degrees. Many places in Himachal Pradesh experienced the pang of cold, where during the past 24 hours Keylong in Lahul-Spiti recorded minimum temperature at -4.9 degree Celsius, Kalpa-1.0, Dalhousie-0.2 degree Celsius, Manali- 0.0 degree Celsius and Shimla recorded 3.4 degree Celsius, the India Meteorological Department (IMD) revealed. Jammu and Kashmir's Rajouri area also received fresh snowfall today. 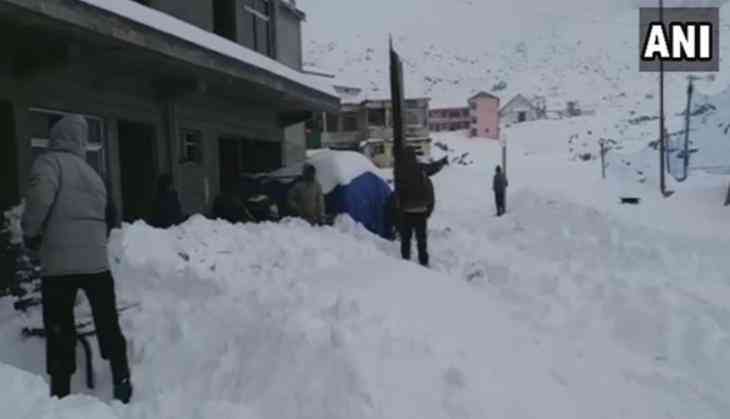 Meanwhile, snow clearance work was underway on Mughal Road that connects Poonch and Shopian districts in Jammu and Kashmir. The national capital was engulfed in fog early Wednesday morning. At least 13 trains were delayed, 10 cancelled and one rescheduled due to foggy weather and low visibility in Delhi.